Last term we ran our first big project - iShare. We wanted to share good Digital Learning practice with our peers. We decided to work with the Yr8 students (12-13 year olds). 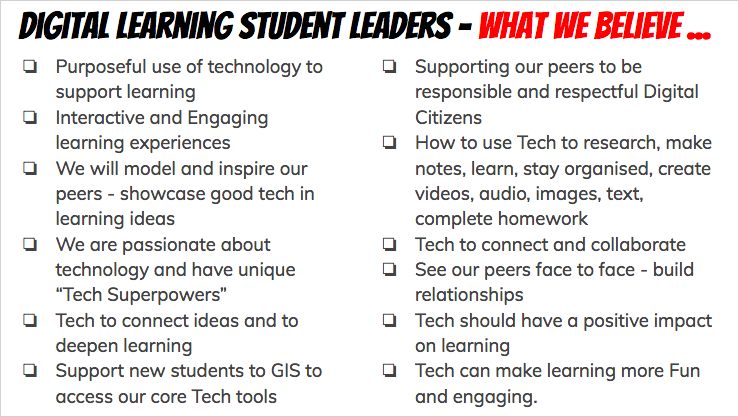 This was a Speed Geeking event where students had 5 minutes to go to a table of their choice and to learn about the particular tech tool being presented by one of the Digital Learning Student Leaders. We received very positive feedback from teachers and students and there was real high energy as we all shared our top tried and tested tech tools. Students asked for more and for more time to be devoted at each table. We are looking into how we can run this again and meet their needs. Our next project is to look at creating a Digital Learning space in our library - manned by us, where students, especially students new to learning with tech, can drop in and get some help.